Brief: Write and shoot a short narrative film. Write the script. Begin by making it very clear what the conflict is and developing the story by showing the main protagonist attempting to overcome or solve the problem. Use a variety of locations to give the film some scope. Storyboard the film, making detailed notes on eye-lines, screen direction and the action-axis. Your narrative must apply the rules of continuity editing. You must show a clear understanding of and extensive use of editing techniques in this film: empty frame, match-on-screen, movement wipe, POV etc. Be sure to shoot to a high standard. Aim for perfection. The idea for this story was inspired by an anecdote on the Humans of New York website, in which a mother told how, on discovering a letter saying her daughter had missed the application deadline for university, served the letter up for dessert after dinner, and they had started arguing. 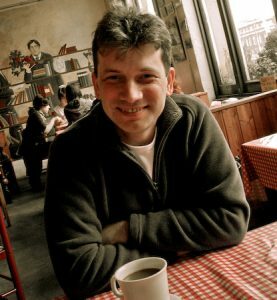 Please see my detailed discussions on how I found and developed this story in my blog posts ‘Assignment 3 – finding and developing the story’ (Salisbury, 2018) and ‘Assignment 3 – screenplay’ (Salisbury, 2018), including how I gathered potential ideas, developed the story for ‘Mother and Daughter’ through log-line and step outline, and drafted several versions of the script. There are two glaring errors in the film. The first error occurs towards the end of the car sequence (01:44 – 02:02) in which the daughter gets out of the car and crosses the road to the school gate. This was filmed as a single master shot. 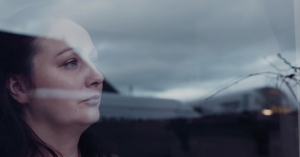 I cut this part of the car sequence to show the daughter getting out of the car and crossing the road, an angle on the mother watching her daughter cross the road through the car window, then back to the daughter entering the school gate. In hindsight, I now realise that I should also have filmed a POV shot from the mother’s perspective inside the car looking out, back at the daughter as she walks through the school gate. This would have put the viewer directly into the moment, through the mother’s subjective perspective. It would also have created a far more cinematic sequence of edits than simply cutting back to a very weak end segment of the master shot. The second error occurs in scene 5 (05:31 – 06:12), in which the mother tells the daughter her father will be calling by to collect some things. This was the first dialogue scene we shot for the film and I was still finding my feet directing the actors. I had begun the day by filming non-dialogue scenes so as to help the actors settle in to the location and feel at ease with their roles. Lydia, who plays the mother, has both stage and TV acting experience. 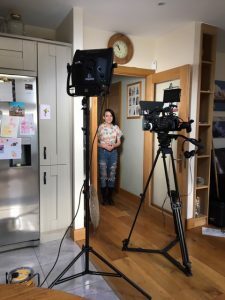 Leila had no experience acting for camera before making this film, other than a single class as part of her performing arts course last year. Visually, this scene feels too static and a little awkward. In hindsight, I should have given Leila something to ‘do’ while delivering her lines, such as pouring herself a glass of water. Also, the framing feels too tight. A wider shot would have worked better here, with a slightly lower camera position to reduce the amount of kitchen counter in the foreground, and placing more emphasis on the actors’ performances rather than on the chopping of the vegetables. Maybe using this as the establishing shot and then cutting to medium shots as the conversation develops would have given the scene more life. Both of these errors could have been avoided. Adding the POV shot in scene 2 and giving the actor some screen business in scene 6 would have improved the overall feel and flow of the film. Several shots in ‘Mother and Daughter’ where designed in response to films I have seen recently. For example, I was particularly interested in the way Kurosawa had framed characters in two separate rooms within a single shot in The Bad Sleep Well (1960). 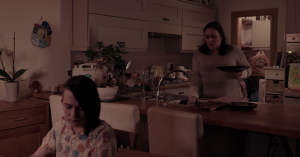 This gave me the idea of using a similar composition in scene 5, to show the daughter arriving home and seeing her mother in the kitchen preparing dinner. Using a composition like this enabled me to show the two characters in separate rooms simultaneously. It also enabled me to draw the viewer’s attention to the daughter’s expression. I closed the scene with a push focus, from daughter to mother, drawing the viewer through to the next room, preempting the next scene in the kitchen. When storyboarding the film, I was continually thinking about how I would edit shots together. For example, in the final shot of scene 7 and the first shot of scene 8 I designed a very specific cut between two shots of the daughter, where she sits up on the bed and where she is sitting at the dining table (06:30 – 06:52). In the first shot, she starts from a lying down position and moves into a sitting position, ending up in the right third of the frame. In the following shot in which the two characters are at the dinner table, she is still positioned in the right third of the frame. 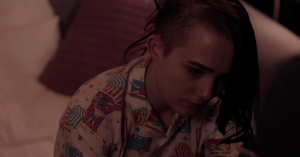 This has the effect of holding the viewer’s gaze on Leila from the bedroom scene and into the following scene with her mother. Therefore maintaining the viewer’s attention on the daughter’s expression, out of one scene and into the next. So as we cut of one scene and into the next, our attention is already on the daughter. This has demonstrated to me how easily you can manipulate the viewer’s attention within frame and drive the emotional emphasis of a scene forward in a particular way. I also looked at ways of introducing visual motifs into the film. One idea I had was through the use of glass. Something which the Polish filmmaker Krzysztof Kieslowski, for instance, uses to great effect in Decalogue (1989) and Three Colours (1993-4). I decided to place the mother behind glass twice, alone with her thoughts. The first in scene 2, after dropping her daughter off at school, and the second time in scene 3, after she discovers the letter in her daughter’s pocket. Both shots use window glass in similar ways to help add emotional depth to the respective scenes. The glass signifies a transparent barrier between the mother and daughter. In both cases, the mother is on the inside, with the outside world superimposed in reflection on the glass. It’s as if she is trapped inside her own world, while her daughter is on the outside, about to fly the nest. With only one and a half days available for filming, I was conscious of the need to be fully prepared and to keep things moving on set. Storyboarding was a key part of the process. I used A4 sheets of paper with five 16:9 shaped boxes down the right side and lines for notes on the left side. Each shot was sketched out and annotated with details on how that shot would be executed – e.g. shot types, pans, key lines of dialogue that occur in the shot, etc. A simple, but very effective visual road map of the film. The pages were inserted into a ring binder alongside the shooting script. Each shot was ticked off once it had been filmed. Shots that were omitted were given a cross. I also made copious notes in a large, soft covered journal bought specifically for this project. 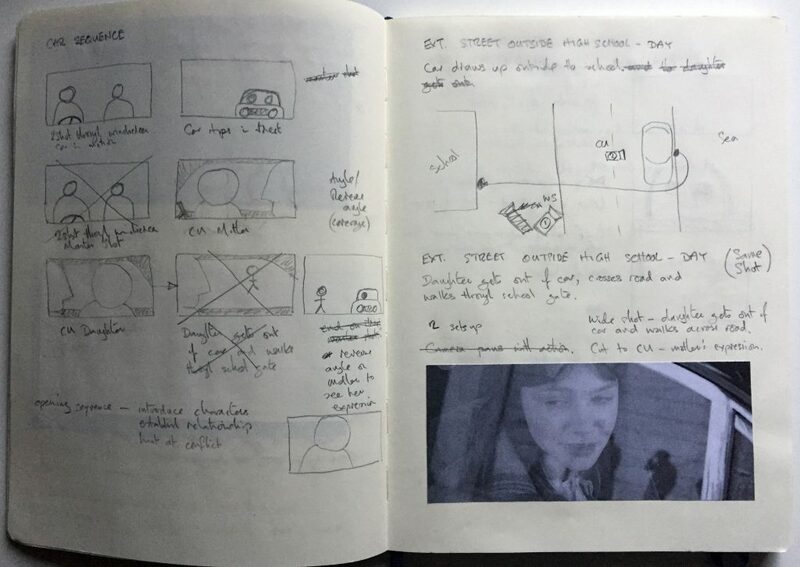 The journal was the first stage in planning the film shoot. 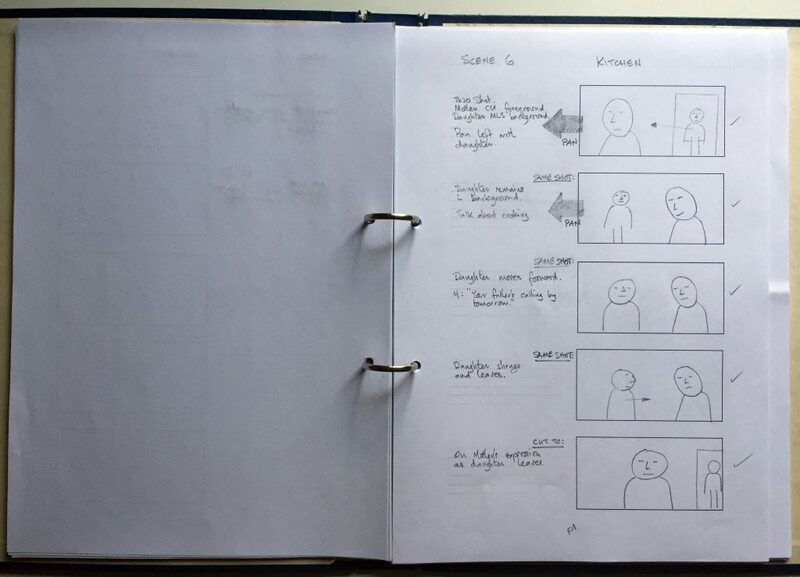 On one double page per scene, I used it to plan blocking, camera positions and moves, to make rough sketches for the storyboards and for gathering reference images from other films to give a sense of how the scene will look. I also used the journal for making notes on how I would light each scene. The journal was always kept close to hand when preparing each camera set up. Not only did this save time throughout the day, but it was also a great way of communicating how I was going to film each scene to my fellow crew member, who helped set up lights and operate the boom. Interestingly, having already prepared and made notes on each shot in advance meant I could think quickly on my feet when things did not work out as planned and required a different camera position or lighting setup than expected. Not only did I feel confident on set with my notes to hand, but the cast and crew seemed confident that things were organised and running smoothly. The most complicated scene to shoot was Scene 8, in which the mother serves up the pavlova to her daughter and they argue. Although blocking the actors was very straightforward, finding the best camera positions for telling this part of the story was difficult. The opening shot of Scene 8 was inspired by the dinner scene in Delicatessen (1991), which gave a nicely framed two shot of the characters at the table. From there I panned right, following the mother as she moves to the sink. This created an interesting composition, in which we see the two characters physically at odds with each other – the daughter in the lower left corner of the frame, with her back to her mother. 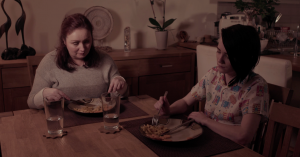 Building up the scene in this way enabled me to use the kitchen counter as a metaphorical ‘obstacle’ between the two characters, across which they argue. My choice of lenses for the film was based on a tip the Irish film director Ronan O’Leary gave me a few weeks ago while attending a filmmaking course in Dublin. He said, when using 35mm movie cameras you only need to use three lenses: 35mm for wide shots, 50mm for two shots and 85mm for close ups. Transposing these focal lengths to the sensor size inside my Sony FS7 camera, this equated to the Samyang 24mm and 35mm lenses for the wide shots and two shot/medium shots respectively, and either a 50mm or an 85mm for the close ups. For close ups I decided on the longer of the two, as it gave a more intimate feel to the close up shots and threw more of the background out of focus. This was very helpful advice when it came to selecting which lenses I would use in the film. 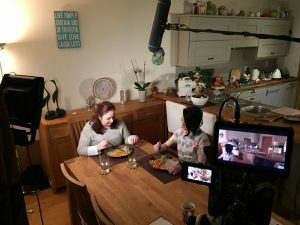 Using three primes lenses for specific shot sizes seems to have resulted in consistent results visually and helped to give ‘Mother and Daughter’ an overall filmic style. A style that is appropriate to the film’s genre and content. Most of the interior scenes required additional lighting. For this I used two Astra 1×1 LEDs, one as key light the other as fill, to help enhance the ambient lighting in the room in which we were filming. In Scene 5, for example, we used two LED lights to help enhance the available daylight within the hallway. The first LED was placed in a room off the hallway to throw light into the far end of the corridor in order to light Leila as she entered the house and took off her jacket. The second LED was placed in the kitchen pointing back at the hallway, providing key light on Leila’s face when she stands in the doorway. Fig. 15, behind the scenes Scene 5, and Fig. 16, behind the scenes Scene 8. In Scene 8, we used two LEDs to enhance the available light coming from the practical lights in the dining area. Lighting this was fairly straightforward. First I exposed the camera for the practical light in the corner of the room, so as not to overexpose the light bulbs. I then added a key light, positioned near the practical light, to raise the exposure a little on the actors faces. Finally, I positioned the second LED on the other side of the camera and added some fill light to reduce the shadow area in the actors faces. This combination of practice lights and LEDs resulted in a natural looking interior night shot. One thing that struck me about making this film was how wonderfully fruitful collaboration can be. Once I had written the script I decided to step back and give the actors room to make the characters their own. Rather than dictate a rigid vision of how I thought they should be on screen, I wanted to let the characters take on a life of their own. Trusting the actors with the characters has resulted in very authentic performances. Also, on my suggestion at the script read through, Lydia and Leila created backstories for their characters, which generated some very interesting discussion during rehearsals on who the characters were, what they were like and, more importantly, what the dynamic between them was like. One of the unexpected outcomes of allowing the actors enough room to build their own characters was the music I have used at the beginning and end of the film. It was great to discover that Leila was also a musician and that she wrote her own songs. While filming her scene in the daughter’s bedroom, she sang one of her songs on camera for us. When it came to editing the film, I was delighted to find that the song’s lyrics and style were a perfect fit for the story. So I decided to include Leila’s own composition rather than use generic music from a stock library. This has added greatly to the overall feel and authenticity of the film. Fig. 1 – Screenshot ‘Mother and Daughter’, scene 6. Fig. 2 – Screenshot ‘Mother and Daughter’, scene 5. Fig. 3 – Screenshot, The Bad Sleep Well (1960) Dir. Akira Kurosawa. Fig. 4 – Screenshot ‘Mother and Daughter’, scene 7. Fig. 5 – Screenshot ‘Mother and Daughter’, scene 8. Fig. 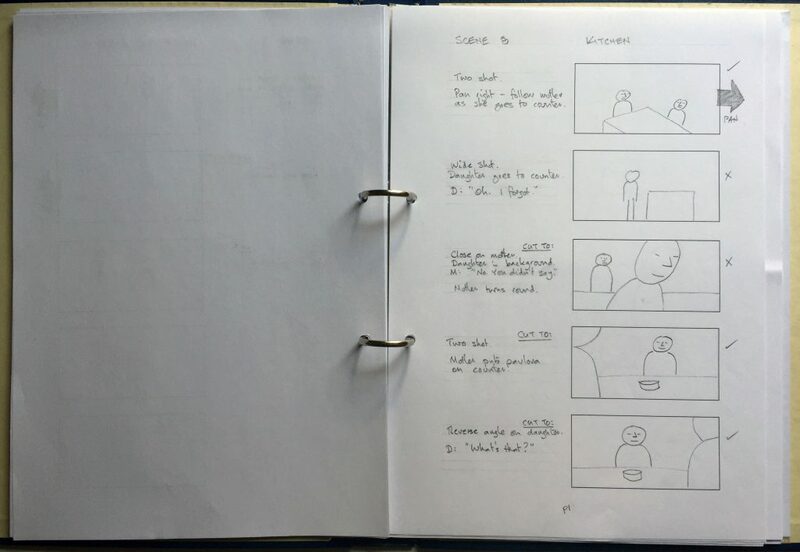 8 – Storyboards for scenes 6 and 8. Fig. 9 – Journal, notes for scene 2. Fig. 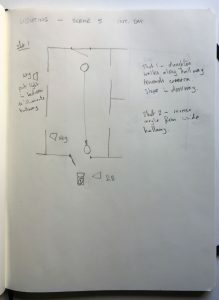 10 – Journal, lighting notes for scene 5. Fig. 11 – ‘Delicatessen’ (1991). Fig. 12 -Screenshot ‘Mother and Daughter’, scene 8. Fig. 13 – Screenshot ‘Mother and Daughter’, scene 8. Fig. 14 – Screenshot ‘Mother and Daughter’, scene 8. Fig. 15 – Behind the scenes, scene 5. Fig. 16 – Behind the scenes, scene 8.